Water NOW or Plant Again Later! When the weather is hot and dry and there is no measurable rain, even rookie gardeners are aware that most plants will not survive without regular watering. Unfortunately, one reaction to this problem is to stand with hose in hand and squirt water on the plants or on the surface of the ground around them. This does nothing but dig up the soil. 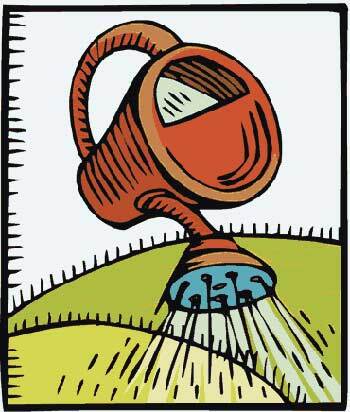 Wise gardeners give their plants the amount of water each one needs in ways that save time, effort and water. For the month of August, it is best to irrigate deeply once a week or every ten days, even less for many plants, depending on your climate zone and soil. Lawns- with the exception of Bermuda and zoysia-and vegetables, certain annual flowers, and some perennial shade flowers are the thirstiest plants in the garden. Water these as frequently as necessary to prevent wilting. Some plants, such as fuchsias and impatiens, need watering daily when grown in containers. When the hot dry wind blows, it is sometimes necessary to water twice a day. Some drought-resistant native and exotic plants need little summer water if any at all. A good rule of thumb is, native plants that are summer deciduous should never be watered during the hot summer months or they’ll die from root rot. Some native plants that don’t drop their leaves in summer should be watered only if they show severe wilting and, even then, watered sparingly if in clay soils. Other plants recommended for their resistance to drought will look better if watered deeply at least once during August. Water all pine trees deeply as needed – usually once every three weeks – to prevent stress in hot weather, which invites attack from bark beetles. Subtropical trees- including coral trees and floss silk trees- should be watered deeply, early in the month. Allowing chorisia to go on the dry side in late August often contributes to more spectacular fall bloom. Remember to keep your eye out for signs of stress and think of each plant as an individual; water accordingly. With deep, infrequent waterings teach them to send their roots far into the ground so that when there’s a drought they will survive. Be sure to give special care to plants in containers. Plants in containers often suffer at this time of the year. Water them frequently. In interior zones containers often dry out as soon as they’re watered. It’s not only the hear, the dry air literally pulls the moisture our of the soil right through the sides of terra-cotta pots. Terra-cotta containers add charm to gardens and patios, but unfortunately for aesthetics, most plants actually grow much better in plastic. The idea that plants are helped by a pot that “breathes” is mistaken. The soil mix itself should breathe. It should be light and airy; use a good planting – never use garden soil in a pot. In containers that breathe, roots follow the water as it escapes through the sides of the pot. They form a soil mat that clings to the inside of the pot, drying out daily and causing the plant to wilt. When plants are grown in plastic, the roots tend to form more evenly throughout the mix. (Eventually they congregate at the bottom and wind around the sides, but then it’s time to pot them on to the next size up.) Before planting in porous containers seal the insides with a double coat of black waterproofing tar, to help prevent escape of moisture. Take good care of your container plants and garden bed s in the month of August, you will be well rewarded throughout the rest of the year.